Ring News 24Boxing News Breaking Boxing NewsCan Tony Bellew upset David Haye again? Can Tony Bellew upset David Haye again? Tony Bellew and David Haye will reconvene “hostilities” in the second installment of their contrived rivalry. I intentionally placed hostilities initially in quotation marks because for all of the WWE-style build up and Bellew storming out of the ring trying to confront Haye at ringside, straight after the first bout they were all friends again. Even seasoned fight observers, used to these type of antics, felt cheated after shelling out £15 of Pay-Per-View coin to witness the purported grudge match. Before the first fight many fans believed Bellew would be too small for heavyweight and it was only a matter of time before David Haye (a former cruiserweight himself, remember) landed the fast, heavy punches and got rid of the Evertonian. However, an achilles injury saw Haye fight for the majority of the contest, bravely it has to be said, severely depleted. Unable to set his feet for the money shots and stuck on the ropes like a sitting duck with little ability to move away, Haye was eventually put away in round 11. 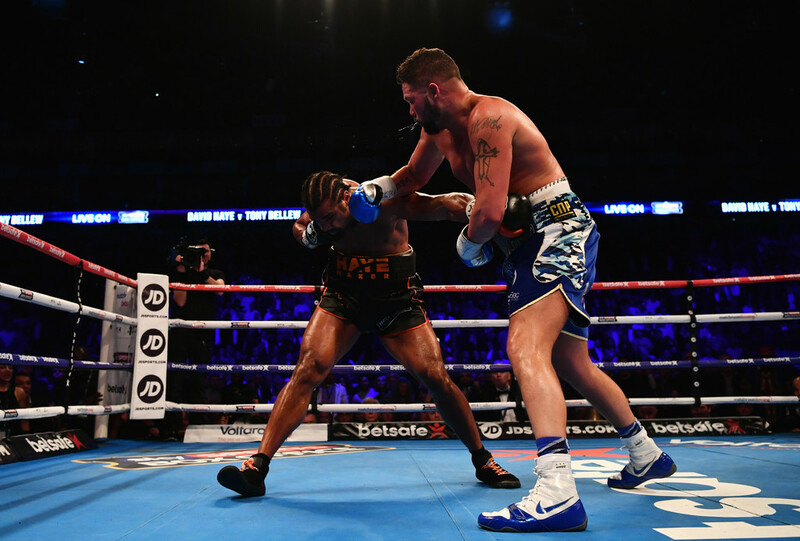 The Londoner had been ahead after five rounds but Bellew scraped away at that lead slowly but surely until Shane McGuigan finally put Haye out of his misery following knockdowns and periods where he looked badly hurt and ready to go, round after round. Now the rematch has come along and the David Haye bandwagon has refilled and is rolling on once again. The beef element has been resumed, the Sky hype machine functioning in full overdrive and we have a competitive fight again. I firmly believe that not only can Tony Bellew upset David Haye but I reckon he will repeat the feat he achieved on March 4, 2017. I reckon that Haye is too heavy and generally too muscular for his injury prone frame. When he leans the muscle down on his joints and ligaments I see an ageing body groaning under the pressure. I would not at all be surprised if Haye ended up injured again during the fight. After all, we have already had to postpone this return bout once after Haye withdrew from the original December 17 rematch date with a bicep injury. For Haye this is a chance to push his way back into the title picture at heavyweight and use his fading name value to secure big money showdowns with the likes of Anthony Joshua, Tyson Fury or Deontay Wilder before it’s too late. Lose for a second time and Haye might be finished at the top level forever and will need to focus instead on building his stable on Dave TV. Bellew, meanwhile, could retire if he is beaten by Haye and he could even retire if he wins. Putting money in to the bank and securing his family’s future appears to be Bellew’s main aim. If an opportunity to fight one of the heavyweight big boys arose then I have no doubt he would take it. It’s a shame Bellew did not stick around to box the likes of Briedis or Usyk in defence of his WBC strap but who can blame him for moving up and joining the circus for a neat cut of the Pay-Per-View pie? Whoever wins or loses, both men have enjoyed lucrative careers, but I would venture that there’s a bit more value left in Bellew’s ring future than his opponent’s. Will Boxing’s Ring Girls Be Next To Go?